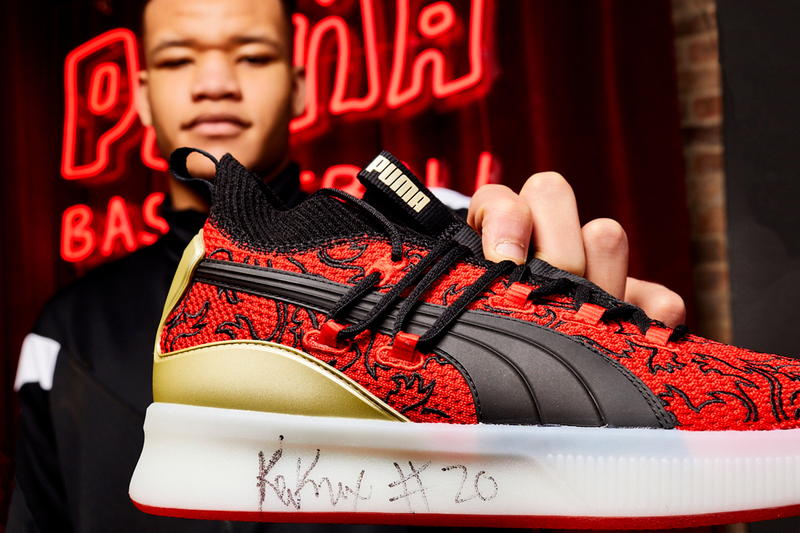 NY Knick Kevin Knox Unveils PUMA's Clyde Court "London Calling"
An ode to British culture. Last month, we saw PUMA‘s Clyde Court “Peace on Earth” iteration release to help the fight against gun violence in America. Today, the line’s first basketball sneaker in 20 years takes a flight to London with its latest colorway. Dubbed “London Calling,” its knitted upper features a red base with black lion graphics throughout, paying homage to the English Lion, a national symbol of strength. New York Knicks’ Kevin Knox is expected to sport the new colorway against the Washington Wizards today for this year’s NBA London Games at the O2 Arena. The PUMA Clyde Court “London Calling” is currently available at select PUMA stockists in the US and UK in addition to Puma.com for $120 USD. In related PUMA news, you can take a look at its upcoming SANKUANZ collaboration. Behind the scenes at the label’s Paris Fashion Week show. Luke Meier flexes louche layers and modern minimalism. The video is directed by Nick Stelo. The Swoosh’s tallest Air Bag in history.